Three things that I love about living in Pakistan are winters (since they are extra special for us as after a long spell of summer and dry fall season), weddings (because why not?!) and winter weddings! So, I am naturally a bit hyper-excited about the wedding season. Kickstarting a new series whereby I would be talking about my wardrobe essentials for weddings, making intelligent choices for your wardrobe without creating a hole in the pocket, as well as, my first-hand experiences with different salons and photographers. While there are various brands popping up with their luxe ready-to-wear collection every wedding season, I am an advocate of smart shopping and customising clothes to my liking every now and then. While the process of shopping for lose fabric and customising the kaam wala jora is a pain for many, I enjoy the entire process - from finding the perfect fabrics for mix and match to getting it stitched, unless the darzi imposes his marzi a bit more than required! Since the trends keep changing, sometimes it is hard to keep up with them, especially when it comes to formal wear as one does not get to wear formal dresses every now and then. (I never have a problem in repeating them if I like them.) For this purpose, I would be sharing some of the outfits from my closet, which have passed the test of time and saved me from getting a new dress made every time. In the first look of this series, I am sharing one of the wedding party wear dresses - a multi-layered dress (yes, you can layer up for the winter weddings by making smart choices and not feel cold even if it is an outdoor night event): a panelled maxi with a front open gown and a heavily embellished dupatta with you folks. The reason that I have picked up this particular look for the first post is that it is easily one of the most easy-on-pocket dresses that I designed myself. Since it was for an extended family wedding and I did not want to spend too much and yet go for something better than a usual shirt and trouser. 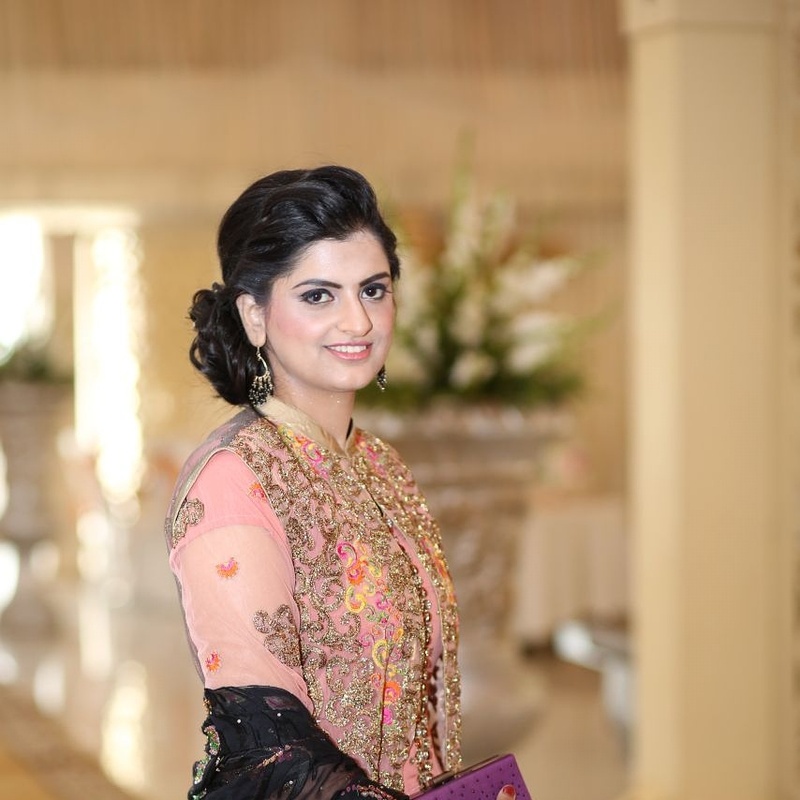 Dupatta: I have had my eyes on this embellished dupatta for as long as I can remember. It was from my eldest sister's dowry (who got married ten years ago, FYI) and she promised to hand it over to me after she'd be done wearing it multiple times. lol. She did not use it as much (since she one of the kind who never repeat their dresses) as it deserved and it took her nine years to finally have the generosity to pass it on (because it was one of her favourites - and a part of the first dress she had got on the first day of her wedding shopping). Appreciate this handmade gorgeousness with me! It is a black chiffon barosha dupatta with heavy traditional (re: classic) hand embroidery with embellishments (sequence, diamontes, katt daana etc.) in plum and green. The dress that it was originally a part of was an original from Usama Silk, F-10 Markaz, Islamabad since what seems like forever. Back in the day, they used to make exclusive formal dresses (only one unstitched dress in one design and colour). Cannot emphasize much on how I miss those. I got this shirt front and sleeves piece from Faisal Fabrics, also located in F-10 Markaz. It cost me around 3000 PKR only. For the back, I got the plain black net fabric with a hint of gold from a Pakhtun's shop, located in F-10 Markaz's basement, adjacent to Usama Silk, for PKR 300 per yard. They have a huge variety of embellished and plain polyester and cotton net amongst many other fabrics. One can simply design a gazillion dresses on a single visit. I have actually met a couple of local designers who stock at Latelier, Islamabad, over there. My mom dreads accompanying me there as I can never leave the shop empty-handed. I had purchased two kaamdaani/mukesh dupattas from Lahore for PKR 3000 two years ago. This flared/panelled maxi required about 5 metres of cloth. Purchased it from a local lace shop in Islamabad for around 1000 PKR. Earrings: My brother got me this from one of his official trips to China long back. The katt daana details went so well with my outfit. Bangles: From my first and what seems like the only trip to Anaarkali Bazaar, Lahore - Best bangles at the best price - PKR 250. Can you believe that? Also pictured here is the wedding reception dress, also designed by yours truly! Bracelet: Random jewellery seller at Jinnah Super, Islamabad - PKR 250. Rings: Chunky black one: Random jewellery seller at Jinnah Super, Islamabad - PKR 250 and the rest from Haroon's Gift Shop - PKR 290 each. Clutch: Haroon's Gift Shop - PKR 1200. Quite a steal for the price. Party makeup from Seemi's Salon and Studio. I had not made an advance booking so this one is NOT their signature party makeover. One of the junior makeup artists did it but Seemi herself gave the final touches. It had cost me PKR 3500 since the escorts of the bride were offered a special discount. Pastry? Poorly Highlighted Face + Cakey and Uneven Foundation 101. I'd definitely have washed my face if I had not gone straight from the salon. All I would say is that I was disappointed. Although I am not a pro when it comes to makeup, I could have easily done a better job myself. However, I would neither recommend their Signature Party Makeup (that some of my family members got done - Charges: PKR 5000) nor the Bridal Makeover (that my extended family member got done for her walima). Nail Colour: Colourstudio Haute Nails 232 Royal - PKR 250. Seemi's Salon and Studio again. The party makeover included hair styling. I wanted a side bun with my hair twisted and tucked to one side (without looking older than I am. And I did not. At least I think so). Since I was unhappy with the makeover - no colour correction for the blemishes and pigmentation, and uneven and patchy foundation, the hairstyle kind of saved the day for me. The idea is to share some cult classic tips and tricks that add a personal touch to your formal dresses and save them from being labelled "outdated" before you've worn them more than once even (as one does not get to wear desi formal clothes often). I don't. I hope there are many like me out there who would find these tips useful. P.S. Since this was a customised dress and you may not find exactly the same stuff everywhere, there are a few tips and tricks to save the day for you. A. Dupatta is the desi swag. Choose one and design the entire outfit accordingly. Find a vintage dupatta at home (raid your mum's closet) or simply go for those jamawar, cotton net, organza dupattas and made-to-order/embellished velvet shawls, which are all rage and easily available in the market these days, can serve the same purpose. I have my eyes on a few since last year. Just waiting for someone to get married so that I can find an excuse to go get one. When you're not high on budget and you still want to make a style statement, let the dupatta do the talking. Just pair it up with a plain jora and drape it on one shoulder or the front and you're good to go. I already plan to make a plain raw silk black dress (shirt and pants)with this one. B. You can make the outfit heavier (and more expensive) by using a heavy kaamdaani fabric for the maxi/kurta (whatever you want to pair the dupatta/shawl up with) instead or you can just go for a plain dress and let the dupatta stand out as stated in A.
C. The key is to mix and match. I used chiffon barosha, chiffon with mukesh/kaamdaani and net in this one dress. D. Stitching makes all the difference. Even a simple outfit stitched to perfection can make you stand out. I usually prefer maxis and anarkalis etc. when it comes to formal wear because they never go out of fashion. As for shirts and pants/shalwar, the trends keep on changing. Do not forget to share your outfit ideas for this wedding season in the comments' section below.